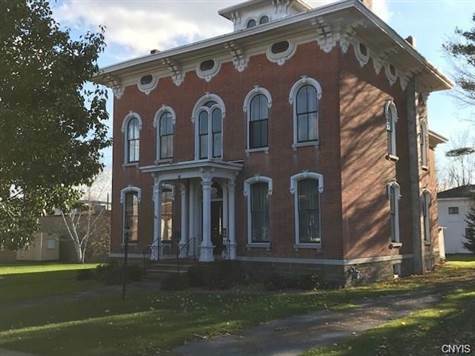 Homes for Sale in Richland, New York $250,000 1st Carriage House Realty, Inc.
EXPECT TO BE IMPRESSED BY THE GRANDNESS AND IMPECCABLE CRAFTSMANSHIP OF THIS REGISTERED HISTORIC VICTORIAN HOME ON A LARGE VILLAGE LOT IN PULASKI. ENTER THROUGH THE VESTIBULE AND BE GREETED BY SOARING CEILINGS THROUGHOUT AND THE ELEGANT HALL WITH ORIGINAL HARDWOOD FLOORS AND ORIGINAL STAIRCASE & BANNISTER GIVING ACCESS TO THE AMAZING DOUBLE LIVING ROOM AND THE PARLOR BOTH FEATURING THE ORIGINAL FIREPLACES. THE LARGE KITCHEN HAS BEEN UPDATED WITH CUSTOM CHERRY CABINETS AND LEADS INTO THE GRAND DINING ROOM W/ ORIGINAL BUILD -INS. FULL BATH DOWNSTAIRS. UPSTAIRS OFFERS 4 TO 5 BEDROOMS, DRESSING ROOMS ETC. THE MASTER SUITE FEATURES A SPACIOUS UPDATED BATH. FORMER ' MAIDS QUARTERS' MAKE AN IDEAL GUEST WING WITH ANOTHER FULL BATH ALREADY IN PLACE. SO MANY POSSIBILITIES HERE, ... HAVE YOUR OFFICE DOWNSTAIRS, LIVE IN THE UPSTAIRS, IDEAL FOR LAW FIRM. B&B AND SO MUCH MORE. THIS HOME IS A DREAM COME TRUE!!! LARGE CARRIAGE BARN AND EVEN HORSE CARRIAGE STEP STILL IN PLACE! CALL US TODAY!